We haven't introduced ourselves for sometime and I see many new names here and thought if you'd like we could introduce ourselves for the new ones and get to know each other and our children, if any readers would like to join in please do so. I have been married 36 years, we have two living daughters ages 35 and 30. We have two cats and a aquarium of fish, just had 11 babies a month ago which was exciting. Chad son in heart lived with us for many years, both my son Chad and Chad2 died together in a car accident on May 10 of 1996. My newphew Cory took his life Jan 30 of 2002. Both Chads loved golf, my son hoped to make it to Pro. 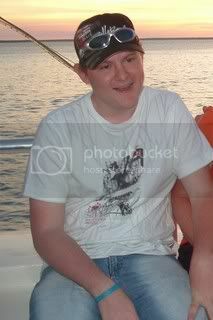 Chad my birth son loved life in everyway and loved people. He played drums, guitar and sang, loved all music. He enjoyed playing any and all sports. Chad had no fear and would try anything and loved to be challenged. Chad reached out to many that were in need of help, he brought many kids home that needed a place to stay, Chad 2 came to our house at age 11 and became our son in heart almost immediately. Both Chads had a great sense of humor, it was such a joy to have them here as long as we did, you seldom seen one withou the other. They both had a sensitive heart to others, always lent a ear, or a hand. I miss them more than words can say, they were both age 21 when they died. My nephew Cory was also like a son to me, every since he started walking and talking we were very close. Cory loved life and all people, he sadly didn't love himself. He was quite the entertainer also, all 3 boys were, they could make you laugh till you cried. Cory was bi polar and had many problems in life he couldn't get ahold of yet he was always there for me and others, when the Chad's died he spent many nights with me with tears falling he had a way to make me smile. The boys are all missed and loved, I still shake my head in disbelief that they left so soon, yet know this is real and their memory and love does live on. Today I can celebrate their lives without that horrible pain of their deaths. I will always wonder what would be, I will always have my down times, all a part of keeping these boys close to my heart and the connection I feel we have today. Life has been "moving on" never dreamt those first years it could. Chad, Chad and Cory are with me always. Two worlds I live in today, here and there. Always wishing it was different, yet know it is what it is and never will be. My name is Brenda and I lost my oldest daughter Jessica in a MVA June 22 2004. She was 16. I have 2 surviving kids, Molly who is now 17 and Chris who is almost 12. Hi.I am Melissa. We lost our oldest son Charlie on June 26, 2004 in a MVA, he was 10 years old. We have 3 other precious children that are my life and give me the strength to go on. Patrick almost 11, Emma who is 4 and Brayden who will be 2 at the end of this month. This board has been my saving grace and to anyone new here please know my thoughts are with you. I am sorry you have a reason to be here, but very glad you found this place. Hi I'm Karen. I have no children of my own, but have been married to my honey Keith for nearly 18 years. We have two nephews and two nieces on his side of the family. On my side of the family my nephew Christopher was the only one - my brother's only child, my parents' only grandchild. Chris was killed by a hit and run driver in Nov. 2003, while riding his bike home from a friend's house. He was three weeks shy of his 17th birthday, a junior in high school. Chris was so looking forward to getting his driver's license and taking his first serious girlfriend Katie to the junior prom in the spring. He was a typical teenager in many ways but did possess a charm and charisma that could not be denied. He had a wonderful sense of humor and a great love of family and friends. He was very good with both young children and older people. Chris was also an avid sports fan, following his father (my bro) and grandfather as a die hard Red Sox fan, he also liked the Giants in football and loved playing volleyball in high school and had run on the track team as well. The biggest tribute to Chris was what his friends posted in his guestbook shortly after his death - stories of his kindnesses and the way he made them feel so good about themselves and how they cherished his friendship - no greater tribute could be found than his good friends.. I miss so much about him - but mostly just watching him grow into the fine young man he was turning out to be - with a purpose and goals in his life, yet an easy way about him that made everything alright - a tribute to his parents Brian and Amy - and his step dad Bob... and his grandparents on both sides who he spent lots of time with..
Greg I am sorry for the loss of your son Joshua. I am glad you found us here and hope you find this board brings you support and understanding and some peace to this horrible loss of your son. My son was a organ donor but unfortunately he wasn't found until hours after the accident. To save another life I would think is another way your son lives on, for me its all the loving memories and I cherish them all. Hello to all of you. I'm Cathy and I've been in and out of here for the past 6 years. I am so very sorry to see all the new names. My heart aches for all of you. We shouldn't even be here but here we are! I lost my precious baby almost 8 years ago on Mothers Day. She was 16 years old, hit by a van while standing in the center lane trying to cross the highway. She was my whole my life. After losing her I feel no purpose in life any longer. I'm doing ok but life is so empty and lonely without her in it. She had the most wonderful sense of humor, the most loving heart, the most compassionate soul. She made my life so full and so wonderful!! Since, I have not had the life that I had with her. But...........I'll tell ya, she brought so much laughter and love in her short life with me and every single person that she touched. I'm Penny - Mom to Sean and Jason. Sean was on his way home from work on 12/28/05 when he drifted onto the shoulder of the highway, then overcorrected direcly into oncoming traffic. The couple that pushed his car into the guardrail didn't even have a chance to hit their brakes. Sean was 22 years, 18 days old when he died instantly in the accident. My life changed forever in that instant. The past 25+ months have been a journey. I'm blessed with Sean's presence most days and I am so grateful. This journey continues to be so very challenging and yet I am blessed. I am blessed that I was lucky enough to be Sean's Mom. I am blessed that I feel him so close most of the time. Given the choice I would have chosen any other path but the one that I am on, but I'm doing my best to learn to live gracefully with Sean's passing. I don't always succeed, but I'm doing my best. My name is Judy. I am Marc's mum. We live in Darwin, Australia. Marc died just over 14 months ago at the age of 18. Like a lot of us here he died in a MVA. He was a happy go lucky boy that loved his family and friends. He adored his niece Makayla (Kayla) my grand daughter. 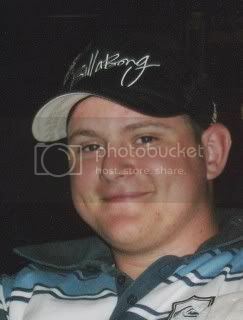 He is missed so much by his sister Danielle (27) and brother Phillip (25). Greg like your son Marc always wanted to an organ donor but like Debh's he didnt get a chance to be. Love to all our kids who didnt get the chance to be who they wanted to be. Sorry really dont know what to say other than what I have said in other posts.